The hinges have an allen head on top to allow spring winding with an allen key. The UL Series have a 1 1/2 hour fire rating. Spring hinges use the energy stored during the opening swing, in the coiled spring, to close the door. For doors to 60 pounds, use one UL and two same size ball bearing hinges. 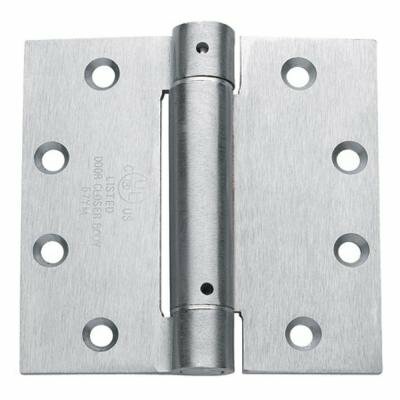 For doors to 110 pounds, use two UL hinges and one same size ball bearing hinge. For doors to 160 pounds, use three UL hinges. Adjustable spring tension can be increased or decreased by using the included Allen Wrench. Can be installed on right Hand or left-Handed doors measuring 4' X 8' and up to 180 LB. Comes complete with a Allen wrench, Adjusting pins, and Instructions. Automatically closes door Alternative to overhead mounted Door Closers. If you have any questions about this product by S. Parker Hardware, contact us by completing and submitting the form below. If you are looking for a specif part number, please include it with your message.